Well into the 20th century, Native American physical remains were frequently harvested like trophies, and ritual objects and artwork often reached museums under questionable circumstances. 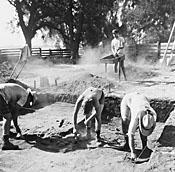 Such glaring offenses of imperial archaeology ultimately motivated Congress to pass the Native American Graves Protection and Repatriation Act (NAGPRA) in 1990. This provocative, in-depth documentary examines the Act´s underlying moral and political issues, its practical consequences, and the prospects for science in the post-NAGPRA world. Some (though not all) archaeologists and scientists claim that NAGPRA will prevent important study and research. Native Americans say that no one has the right to dig up and examine their ancestors´ remains. Divergent realities of power, responsibility, and history make the debate vociferous, and simple answers impossible. This unique video is sure to provoke discussion and raise awareness in all courses in anthropology, archaeology, Native American studies, and museum studies. It was produced by Nicholas Nicastro. Having screened it in my introductory archaeology class, I find this video remarkable for how many ideas it explores in just under an hour. Balanced and thoughtful, it provokes class discussion on a wide range of topics. — Thomas P. Volman, Prof. of Anthropology, Cornell Univ.